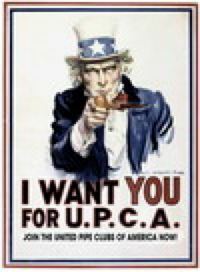 UPCA will host the 2011 U.S. National Championship in slow smoking at 1 PM on Sunday, May 15, at the Chicagoland Int'l Pipe and Tobacciana Show. The contest pipe this year is a very nice Chacom billiard; the tobacco is Dunhill Early Morning Pipe which recently returned to the U.S. market. We again hope to send the winner to the World Cup competition which will be held in the Netherlands next October. There seem to be more contestants each year as slow smoking contests catch on across the country and more smokers experience how much fun such competitions can be. We will have places for about 100 contestants this year so we urge all to start practicing and then step up to the challenge. You may register in advance online or at the show. Note also that to help prepare for the Championship, UPCA has organized a free "how to do it" workshop on slow smoking which will take place in the tent at 5 PM on Saturday, May 14. It will be led by Raymond Lykins, the 2010 U.S. National Champion, who also placed well in the international competition in Portugal last fall. Whether you are a first-time contestant or a veteran of several competitions, Raymond will have a lot of practical insights and helpful advice to offer. So bring your pipe and tobacco and come to learn from the Champ.